The Big Rapids Auction is now seeking quality consignments and farmer close-outs. Dealers Welcome! 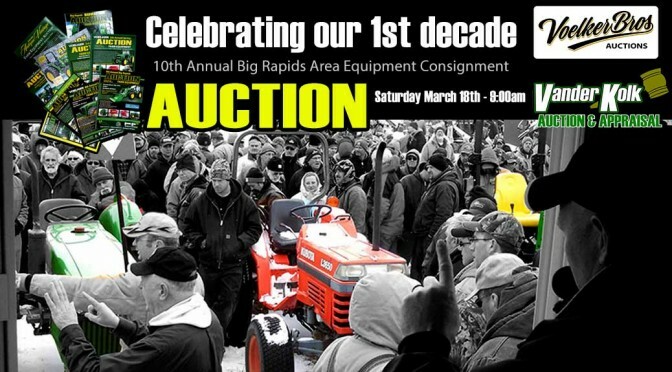 Join us for the 10th Annual Big Rapids Auction. Fill your farm, construction and lawn & garden equipment needs. Featuring late model and gently used equipment. We will be running 2 auction rings all day. Online bidding will be available through proxibid.com. Items may be previewed at the Big Rapids Auction site 21130 22 mile rd. Paris, MI corner of Northland Dr. and 22 mile rd., 3 miles north of 19 mile rd. exit. If you have items you are considering consigning, see the information below.